In mid March, Dunedin’s iconic chocolate factory closed its doors behind me. I had held my final workshop (of 60) and said farewell to the last of some 280 people I had worked with over the last eight months. 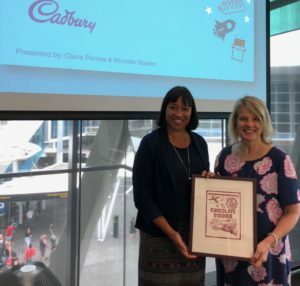 I handed back my swipe card, cleared out my office, gave the incredible union rep, Donna, an enormous hug, and walked out into the main street with a tear in my eye, but also with an enormous sense of hope and faith in all the people I had met and worked with at Cadbury. For eight months, I had talked ‘change’. There were stories of excitement of what was to come; of families leaving town for jobs elsewhere in the region; of unexpected jobs being offered; small and large plans being made; fears about the unknown; trepidation about applying for a job for the first time in 10, 15, 25, 35 years for some; and travel plans taking shape for others. I shared the joys of celebration as people were awarded their Polytechnic Diplomas. People stopped me in the corridors to tell me about the jobs they had been offered. Many shed tears as they told me, which only made me shed a tear too. Laughter came quickly once the initial introductions were over on first meeting me, and at the end of so many sessions there were smiles and high-fives as we worked magic on CVs, created a plan, decided on a course of action, or affirmed a deeply held desire for change. There were also many tissues used up, as I sat with people when the tears fell, and they talked of their time at Cadbury, the challenges of starting somewhere new, the friends they had made there, and the end phase of a large part of their working life. Sometimes, the sun would be rising over the city when I was running workshops for back shift (12am- 8am) staff who had just completed another night in the factory: I battled on ignoring their yawns. 6am was possibly not the best time of day to be enthusiastically discussing the steps for starting a small business. Retirement workshops were not just for the ‘old’ folk: many of the ‘younger’ ones got a lot out of thinking about what they had to look forward to in the fast lane of retirement! Interview skills workshops were probably the most sought after, and some serious advances were made in helping each other to speak confidently about skills, strengths and aspirations. It paid off too. Over 8 months I witnessed the hard work and dedication of almost every single person at Cadbury taking advantage of 1:1 coaching and Career Transition workshops, as well as the support that the company brought in from many other service and educational organisations. Me with Michelle Staples (right) and an original print of the Chocolate Soldier design for the first magazine published in the 1950s. 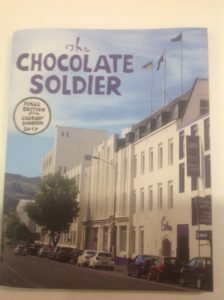 I have since heard that over 90% of the folk at Cadbury had secured either new employment or were engaged in some activity that they had prepared or planned for. I salute their resilience, courage, bravery, good humour, kinship, and determination. I know others may not be in a secure situation though, and to those people, I honour their courage and resilience even more profoundly. Finally, I commend my colleagues at Career Partners International, who secured the contract with Cadbury to provide Career Transition and Coaching support, and trusted me to deliver the content. 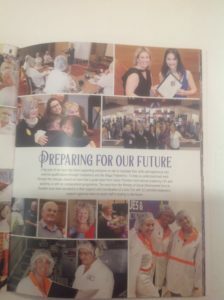 Theirs is the most professional and caring organisation, the materials they produced were excellent in quality and content, the CMS reporting systems robust, and I was always secure in the knowledge that I had back up from them every single day, even though they were in Auckland and I was in Dunedin. It was an absolute honour to be of service working at Cadbury, however small my part was in supporting people going through a challenging time. I did make it into the last of the Chocolate Soldier magazines, so I guess I did something right!